Sung to the tune of the Animaniacs theme song*. If you aren't familiar with Animaniacs, go here: [link] Listen to it a couple times. You'll catch on real quick. Trust me. 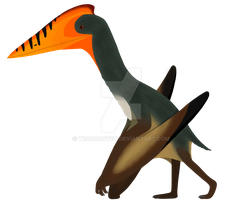 The three main singers are Deinonychus antirrhopus, Jinfengopteryx elegans, and Archaeopteryx lithographica. 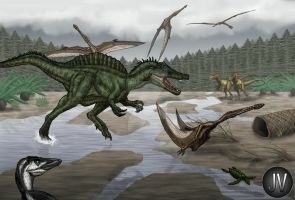 Other dinosaurs here are (in order of appearance): Passer domesticus, Albertonykus borealis, Caudipteryx zoui, Therizinosaurus cheloniformis, and the skull of Tsaagan mangas. I'm not sure how difficult my writing is to read. No doubt it's probably a tad small. So, here are the lyrics. In some of us our teeth do lack. With our semilunate carpals we can tuck our arms away. Or else you're gonna pay! We can run up trees real fast. We need agility and speed because predators abound. We prowl where food is found. We're survivors to the max. When a space rock left a crack. *Animaniacs and all related elements, including the Animaniacs theme song, are property of Warner Bros. The drawing and parody lyrics are mine, though. **Here "raptor" means maniraptor, not deinonychosaur or hypercarnivorous bird. ***Maniraptor forelimb reduction is also found in many flightless birds, and to a lesser degree troodonts and some oviraptorosaurs. However, none of these have the strangely powerful forelimbs alvarezsaurids did. Or else you're gonna pay!" Every theme song needs the lyrics ''Paul, Gregory''. Every. Single. One. Of course; it was a given. I can't believe how many theme songs violate this important law.